The West Coast Eagles became the first non-Victorian team to win the VFL/AFL premiership in front of 1992 in front of 95,007 people at the MCG on the 26th September. The Eagles beat the Geelong Cats 16 17 113 to 12 13 85. Peter Matera, the best on ground (BOG), led the eagles on a third quarter revival after the cats lead by 2 goals at half time. He was later named the Norm Smith Medallist for the BOG in the Grand Final. 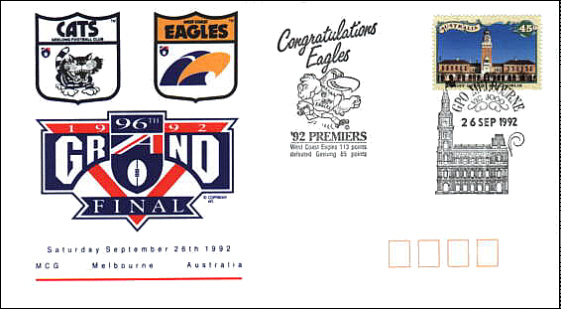 Australia Post produced an AFL Grand Final Souvenir Envelope (SE193). 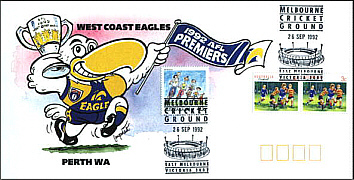 The envelope featured the Geelong Football Club Logo and the West Coast Eagles Logo with a special cachet overprinted on the envelope congratulating the Eagles. Details of both teams performance was printed on the back. The postmark, the GPO Melbourne Pictorial Postmark (PMP402), was used dated the 26 September 1992. The MCG Pictorial Postmark (APM23600) was also used. The Western Australia section of Australia Post also issued a commemorative envelope showing the West Coast Eagles mascot waving a flag (SE195). 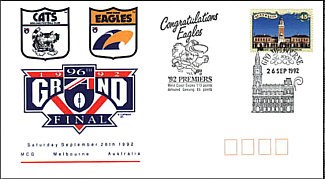 It featured the MCG Postmark (APM23600) with the 3c Aussie Rules Stamp (See Below), the Perth Philatelic Centre Postmark (PMP429) and even the cachet used in the above envelope as the Postmark. One cover showed the Scores of the match typed on the cover.